You are currently browsing the archive for the Hoof Anatomy category. Inside the Thoroughbred Racehorse: Just Watch This! Check out this amazing database of equine anatomy photos from the Cornell University College of Veterinary Medicine, designed to accompany ‘Rooney’s Guide to the Dissection of the Horse’. Please note: The images in the database are photographs of dissected cadavers. The database and images associated with these pages are intended for use by veterinary professionals and may not be suitable for all individuals; parental guidance is advised. To begin browsing the database, click the large red button labeled ‘Search the Database’ on the home page of the database. For anatomy photos of the equine hoof and lower leg – choose [Chapter 6: Forelimb] from the Select Chapter drop-down menu. Should a Horse’s Hooves be Symmetrical? Is this a normal, healthy hoof? 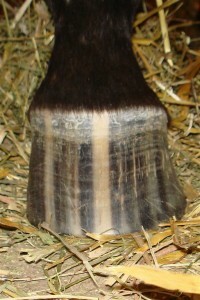 This hoof is not symmetrical - the hoof wall on the left side of the photo is more upright, while the wall on the right side of the photo is slanted outward. Author, veterinary pathologist, and authority on equine biomechanics and anatomy Dr. James Rooney, DVM, says yes – and no. Left and right hooves are often symmetrical images of each other mirrored across the center line of the horse’s body, yet are not symmetrical across their own center lines. Look at the photo of the hoof on the left. Is this a right hoof, or a left hoof? (Answer below.) The inside wall of most horse hooves appears steeper, while the outside wall has a more gradual slope. 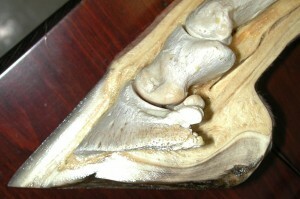 The photo below shows a closeup view of a hoof with a fairly advanced case of white line disease. 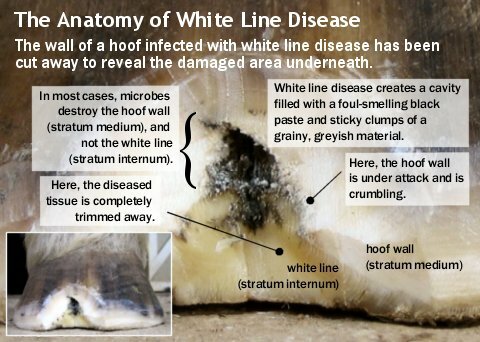 The infection has destroyed the inner unpigmented layer of the hoof wall, leaving behind a v-shaped slot between the dark-colored outer wall and the yellowish white line. Because it is difficult to medicate the active disease at the top of such a deep cavity, the hoof wall has been cut away and diseased tissue has been removed. 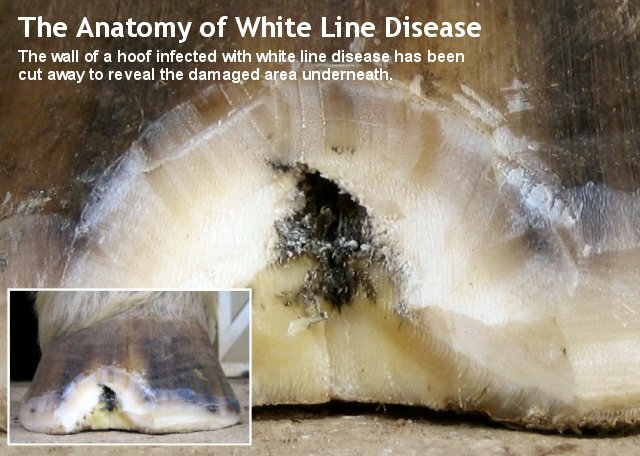 White line disease is an infection that can attack and destroy large areas of your horse’s hoof wall. Click to view larger photo. Not for the faint of heart! Visit the site linked below to see a library of images of equine cadaver feet and legs, showing internal and external, and normal and abnormal anatomy.